Ten Dominican Nuns and six Slaves of the Immaculate Heart of Mary went on pilgrimage to Yankee Stadium. No, not to pay “homage” before it’s torn down to make room for the new stadium but to be with our Holy Father who St. Catherine of Siena called our “sweet Christ on earth. We wanted Benedict XV to ourselves, of course, but we had to share him with 58,000 of our brothers and sisters in Christ. We didn’t mind a bit! 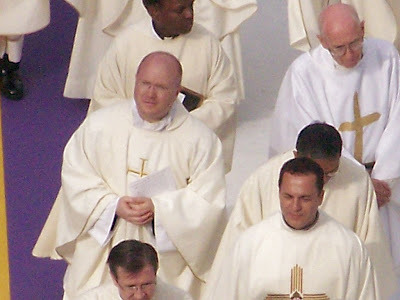 In fact, one of the highlights of being at this Papal Mass was experiencing the unity of the mystical body of Christ. It was a moment when we could unabashedly express our joy and pride at being Catholic. Priest and seminarians were everywhere in their cassocks. As we crept along, moving through the crowds we saw and met religious sisters of many religious congregations. A few people greeted us, recognizing us as the “blog” nuns. Others questioned if we were Nashville or Ann Arbor Dominicans and we were thrilled to be able to share with them that we were the cloistered branch of the Order. We got to Yankee Stadium in about 45 minutes after a delay when the response to Sr. Mary Catharine’s, “everyone got their tickets?” was met with, “Oh, NO!” from Sr. Joseph Maria. The rest of our community was at Mass so no one was answering the doorbells but finally Sister got back inside the monastery and retrieved her precious ticket. We went sailed right through security. As good nuns we took the long list of prohibited articles literally and found that we really could have slipped in our sandwiches instead of having to pay the exorbitant stadium prices. Carrie, one of our aspirants with Sr. Mary Catharine. Carrie came all the way from KANSAS to see the Holy Father...and us! “Keep moving! Keep moving!” volunteers barked as we hopped onto one escalator and then the next. At the mezzanine we waved good bye to Sr. Mary Jeremiah who was seated with her sister. Would we ever see her again? We continued on, up…up….up…to the top tier! As we came out to the stands Sr. Veronica Marie informed up, “I’m scared of heights!” More climbing and we were at our seats: Tier 7, Section S. So high up we were nearly in heaven. But the view was perfect! Hi! Mom! Yes, people said they saw us on TV for a nano-second! The postulants quickly went off, finding friends among the crowds and then the novices went off to explore. Later, with the help of the postulants we made our way through the pressing crowds to greet our Farmington Hills Dominican Nuns who were seated in the Michigan section to the left of us. Our Farmington sisters. Two others were seated in another section. Before the Mass there was a "Concert of Hope" which was probably wasted on most of us who were busy getting in line for the restrooms or just trying to make our way back to our seats! 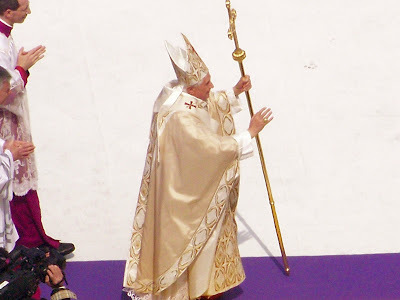 Besides, we wanted to see Papa Benedict! Sr. Mary Catharine and Sr. Mary Amata. Then the moment came as our Holy Father came out in the Popemobile and we went wild cheering and waving our handkerchiefs (provided for us in white and yellow). Benedetto! Benedetto! Viva Papa! We might have been sitting up in the "nosebleeds" but if we leaned over just a wee bit, I'm sure we could have touched him! Pretty close the Holy Father, don't you think? In a world that mistakes virtual reality for the real thing, we can forget what it means to be WITH, to be in the presence of another. In part, I think, that is what the Holy Father's visit brings about. Not only does he come as Father, Shepherd and Preacher of the Good News, but his very presence gathers the mystical body together around the one that Christ has made His Vicar on earth. The holy Father's theme was CHRIST OUR HOPE. Throughout his pastoral visit he kept reminding us to center our lives on Christ, to seek the Truth, to live in obedience and faith. Only in this way will we find true freedom. He challenged the young: "My dear young friends, like the seven men, "filled with the Spirit and wisdom" whom the Apostles charged with care for the young Church, may you step forward and take up the responsibility which your faith in Christ sets before you! May you find the courage to proclaim Christ, "the same, yesterday, and today and for ever" and the unchanging truths which have their foundation in him." Fr. Roger Landry was one of the concelebrants. He is the twin brother of Scott (below). A special thank you to Scot Landry for making it possible for us to make this pilgrimage of hope and most of us enjoyed being with the Boston contingent! Scot Landry with his daughter and son behind him. Thanks to him we were able to attend the Papal Mass.